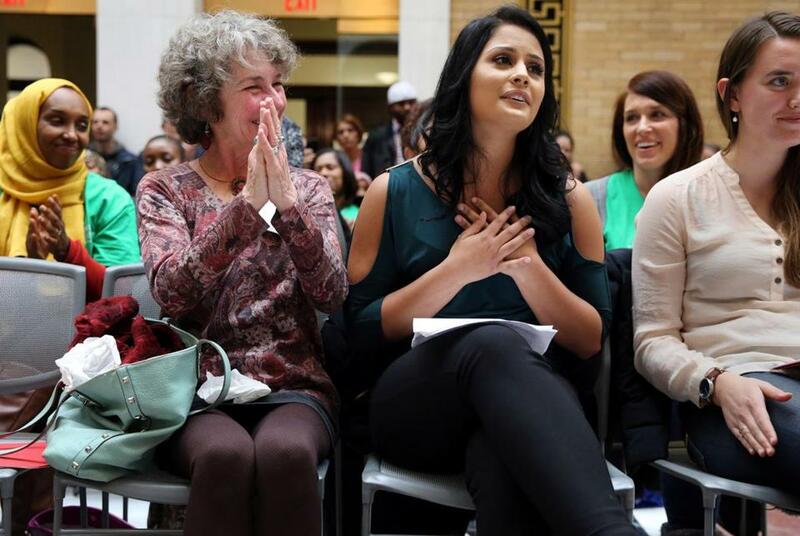 Palloma Jovita, 22, received applause after speaking during Immigrants’ Day at the State House earlier this month. She emigrated from Brazil with her parents and older sister in 2001 and has been a DACA recipient. What if President Trump kept talking about you? There are the 280-character bursts that equate undocumented immigrants to criminals storming the border. The repeated calls to build walls to keep immigrants out. And tweetstorms that treat DACA like a deal to be bartered and not a lifeline protecting more than half a million young people from deportation. On Easter morning, Trump began a series of tweets about DACA, border security, and the country’s immigration laws, and there has been at least one nearly every day since, though he has been tweeting about immigration since before taking office. But young immigrants said they don’t see themselves in many of the tweets, which equate immigration with criminality one day and express sympathy for DACA recipients who have been “abandoned” and received “very unfair” treatment in another. It’s as if, they say, their academic accomplishments, hard work, and individual stories mean little. Instead, they are reduced to stereotypes in the immigration debate that is playing out on social media. The declarations of support are even more confusing, they say, because it was Trump who seeks to end the program that shields them from deportation. And so each news alert or iPhone notification about the president’s ever-changing immigration agenda can be panic-inducing. “Every week it’s a roller coaster in terms of what’s going on with the whole immigration landscape,” said Reina Guevara, a 27-year-old DACA recipient and junior at the University of Massachusetts Boston who is from El Salvador. But being apolitical and checking out completely is not an option, either. A news alert told Palloma Jovita, 22, about Trump’s “NO MORE DACA DEAL” tweet. “I froze because that affects my whole life,” said the senior at Framingham State University, who emigrated from Brazil with her parents and older sister in 2001 and is a DACA recipient. People work hard to make lives in America, said Karla Morales, 20, a student at UMass Boston with dreams of becoming a doctor. She emigrated from El Salvador at 3 with her family. Her mother was an attorney and her father an architect, but they started over and he washed dishes while her mother made piñatas. Then they established themselves, buying not one but two homes in the United States. “For him to just walk in and want to throw that all away is just inhumane,” she said. “You can’t sit in class and be expected to concentrate when your entire future is being decided on,” said Elias Rosenfeld, a sophomore at Brandeis University who is in the DACA immigration program. The security that once came with knowing they could live and work legally in the United States disappeared for many once the Trump administration began ending programs that have protected hundreds of thousands of immigrants from deportation for decades. Immigration authorities stopped accepting applications for DACA in September, when the Trump administration announced it would phase out the program, which is only applicable to immigrants if they have lived in the country since June 2007. Several legislative solutions have been proposed and rejected, mostly by the White House, because they don’t satisfy other parts of the administration’s immigration agenda. Trump also rescinded Temporary Protected Status for hundreds of thousands of immigrants from Central America and Haiti. And he recently ended a special legal status for Liberian immigrants. Weeks ago, he said, Trump was optimistic about the ability to negotiate immigration reform legislation with Congress. “DACA is dead,” Trump tweeted on April 2. The constant back and forth “makes it feel like it’s this sort of a game” that you have to keep watching for updates, said Guevara, who has two little sisters. Her DACA status expires in 2019, which is when her mother’s TPS protection ends.